WM Housing Group are one of the largest and most successful housing groups in the Midlands providing over 27,000 homes and employing over 800 staff. Their aim is ‘Creating places where people are proud to live and work’. One of their most important tasks is keeping their waste wheelie bins clean. 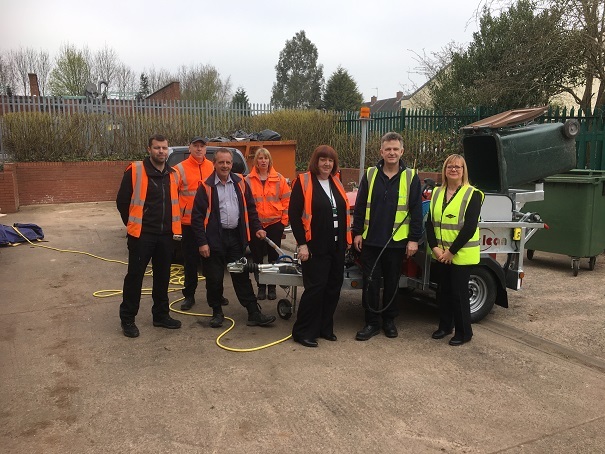 After recently purchasing three paving cleaning systems from Spinaclean via their buying arm Astley’s, Whitefriars invited us to help solve one of their biggest problems: keeping their 1100 litre wheelie bins clean of which they have 340. The Problem: With each bin weighing in excess of 80kg, WM Housing experience much difficulty reaching inside to thoroughly clean the bins out. In an attempt to resolve the problem they devised a tilt and turn trolley which lowered the bin to floor to be jet washed. This in turn created another problem, with all the dirty waste water ending up on the floor. The Solution: Spinaclean’s Wheelie Bin Cleaning Machine. Our versatile system simply hooked on the back of the trailer with the hydraulic lifting mechanism titling the bin into the optimum position, resolving the problem of manual handling issues. This, along with the machines three-stage filtration system, made the cleaning process both easy and extremely economical. Given the size and bad condition of the bins, Spinaclean up graded the bin-cleaning machine from its normal specifications to a more powerful unit with the addition of a Honda GX390 petrol engine running at 15 litres of water per minute. The extra-long lance had a turbo nozzle fitted at the end which rotates the water as its exits the lance for precise bullet cleaning.